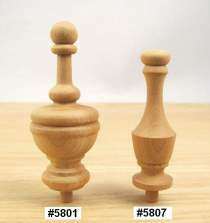 Hardwood finials in cherry. #5801 is 4-1/2"H, #5807 is 3-3/4"H. Both have a 3/8" dia. tenon.